Comments on Whiskybase include “Glen Els is THE German Whisky brand and the distillery with the highest potential in Germany, maybe on whole mainland Europe” and remarks about the taste state “Woodsmoked – this quite unique procedure brings loads of new flavours and spices into this whisky”, “absolutely delicious” and “just a bit of a really nice southern BBQ”. The woodsmoked element certainly sounds intriguing, and it’s nice to discover a new whisky, and distillery trying something different. With so many whiskies out there, it’s important to have something unique to stand out from the rest. 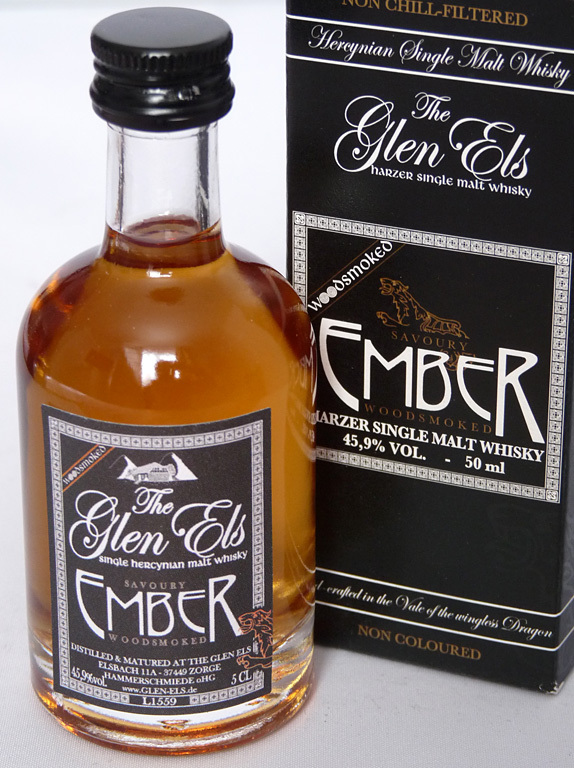 It seems Glen Els have that with their ‘Ember’ offering. It wasn’t so long ago that you couldn’t find German whisky in the UK. My first experience was buying a miniature of Glen Els ‘Unique Distillery Edition’ at auction in December 2013. I’ve had it ever since, looking very lonely on a shelf surrounded by Scottish malts. It was about time it had some friends, so I was delighted to discover that ‘The Whisky Exchange’ were supplying three new Glen Els miniatures (they now do full bottles). Scoring nearly 87/100 on Whiskybase is an extremely high mark, as is 94/100 in the Whisky Bible. 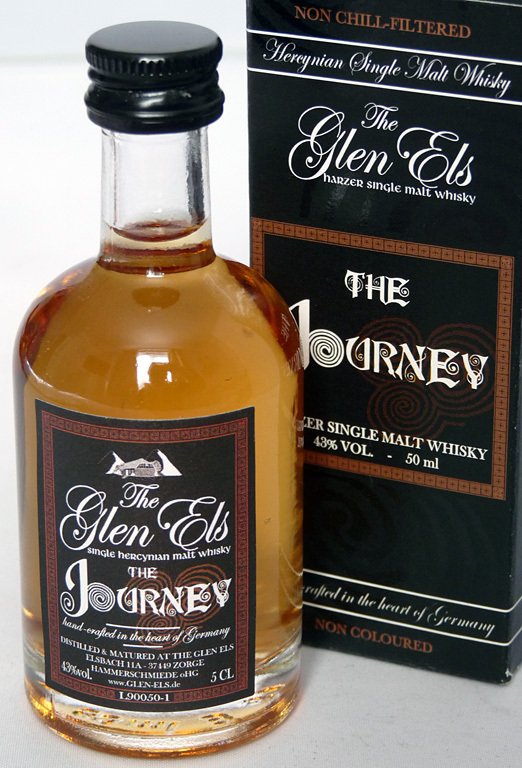 This ranks ‘The Journey’ alongside the classic Glenmorangie 10yo, the Glenfarclas 12yo and the superb Talisker 18yo. It also beats, according to the author, the Talisker 10yo, Macallan 12yo ‘Sherry Oak’ and the legendary Longmorn 15yo, all of which score 93/100. Comments from reviewers on Whiskybase who score this Glen Els over 90/100 suggest the German distillery has equalled or bettered a lot of the whisky being produced in Scotland. I’m sure this is true, and I hope the Scottish producers take heed and fight back. Healthy competition will ensure that standards remain high and the consumer reaps the rewards with excellent whisky such as ‘The Journey’. If you’re considering buying whiskies in an auction, it sometimes pays to look for the more obscure. I noticed this German single malt wasn’t getting much interest so I did a bit of research before bidding. You can buy an identical miniature bottle on Ebay UK, direct from a German whisky shop, but when you add postage it’s nearly £20! Getting a rating of 85.5/100 in the Whisky Bible classes this malt as “very good to excellent whisky, definitely worth buying!” With its price, rarity in the UK, and rating, I couldn’t believe my luck when I got it for £4.25! Everyone else in the auction was scrabbling for boring old bottles of Macallan, and vintage malts (which might not be what they claim to be!) so it was nice to get something different at an excellent price. 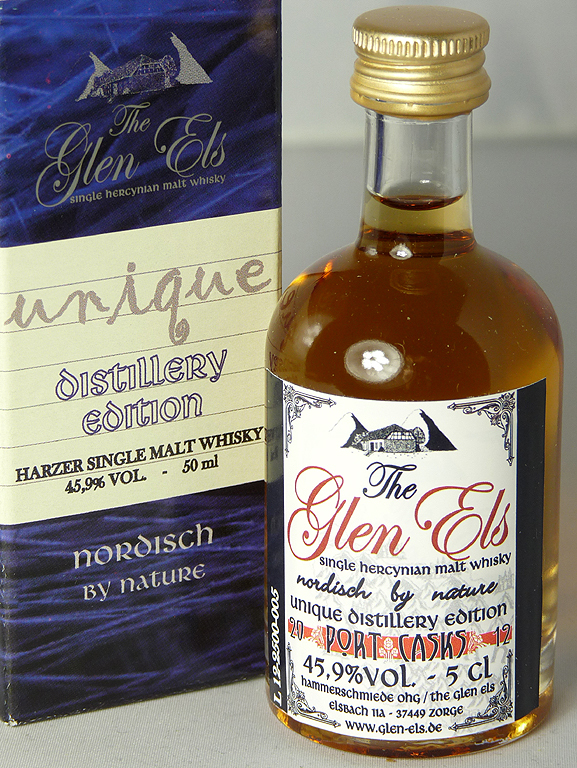 The name ‘The Glen Els’ is derived from the location of the Hammerschmiede distillery in Elsbach, Zorge, Lower Saxony Harz, about 37 miles south of Brunswick, Germany.